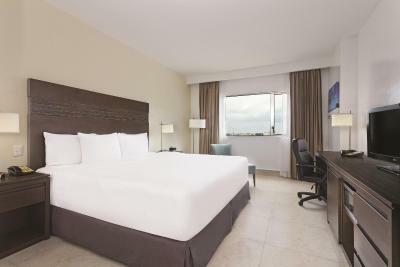 Lock in a great price for La Quinta by Wyndham Cancun – rated 8.2 by recent guests! Location is perfect for my needs. I’ve stAyed in many La Quinta hotels. This has been one of the best facilities, so far. The staff is great, friendly and attentive. Breakfast,outstanding! Better than any other. Confortable room for the price $ and breakfast included. 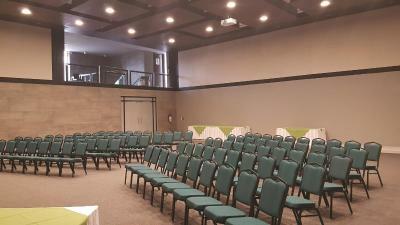 It’s was a good location, everyone was friendly. Room was cleans and comfortable. 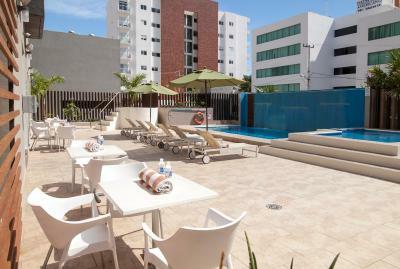 Staff is very nice at LQ hotel and location is good as hotel is located at a main street of Cancun Centro. 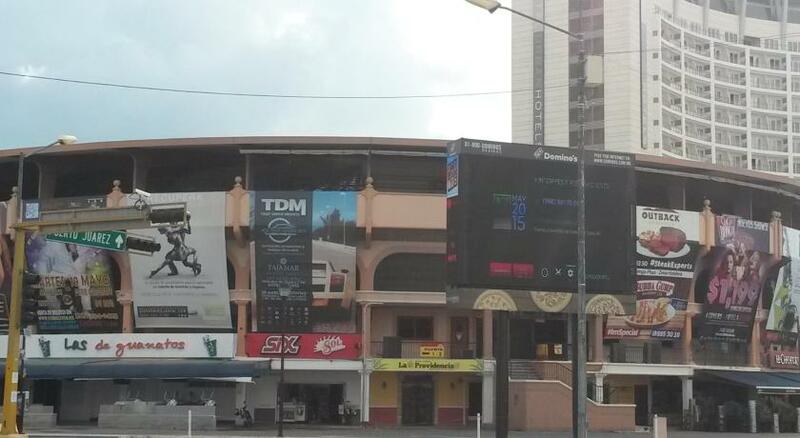 I find te the area is pretty safe to walk to Chedraui or Plaza de las Americas. Access to beach by taxi or bus is very reasonable. 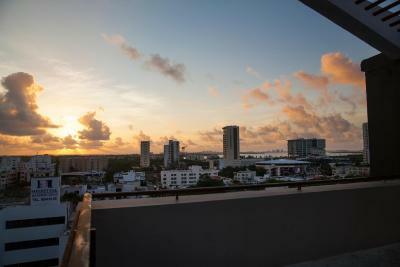 My room with balcony had a good view of Cancun centro. Close walking to many restaurants in the downtown Cancun area. I love the friendly staff. Nice mix of mexican food and continental. the cheese filled things are a hit. I liked the breakfast included in the package. It was great value for money. 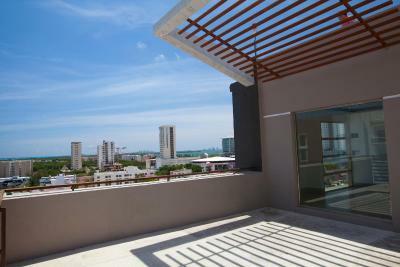 I also like the location as it is located centrally and easy to get public transportation. The taco shop two doors down was fast and courteous. Breakfast was great, the staff was the best. My room had an issue with the air conditioning. Once they changed my room it was excellent. This hotel is very clean, comfortable, and staff is very friendly. 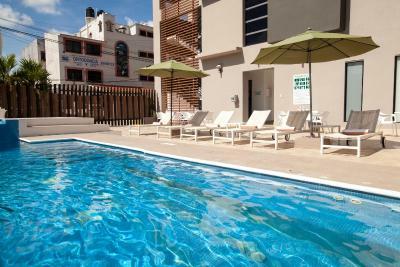 Right next to a convenience store and about 10 mins from the Zona Hotelera. 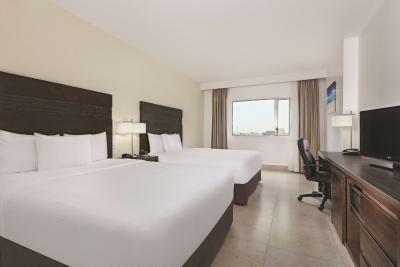 La Quinta by Wyndham Cancun This rating is a reflection of how the property compares to the industry standard when it comes to price, facilities and services available. It's based on a self-evaluation by the property. Use this rating to help choose your stay! 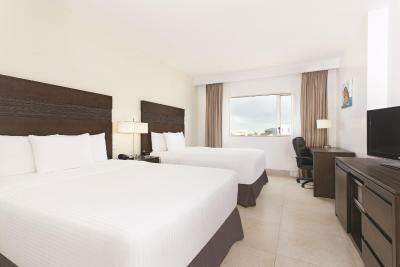 This hotel is located in Cancún, 8 minutes’ drive from the beach. 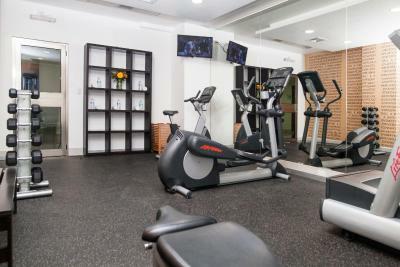 It offers an outdoor pool, fitness center and elegant, air-conditioned rooms with free Wi-Fi and flat-screen cable TV. 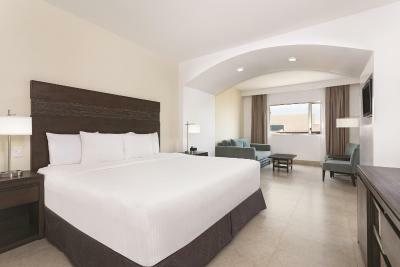 The spacious rooms at the La Quinta by Wyndham Cancun feature tiled floors and modern décor. Each one comes with a coffee-maker, microwave and a private bathroom with hairdryer. 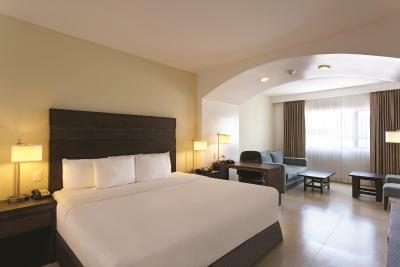 La Quinta by Wyndham Cancun offers a daily breakfast of waffles, cereal, fruit juice and coffee. Free coffee is available 24 hours a day. There is also a lobby bar with a big screen. You can drive to the Mayan ruins of Tulum in 90 minutes. Cancún Airport is a 15-minute drive away. Free parking is available at the hotel. 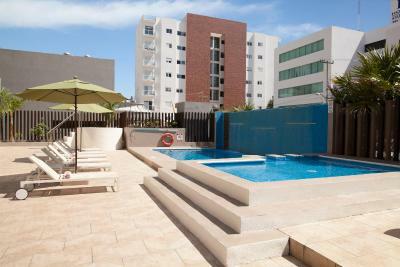 The hotel offers discount for the Cabana Beach Club. 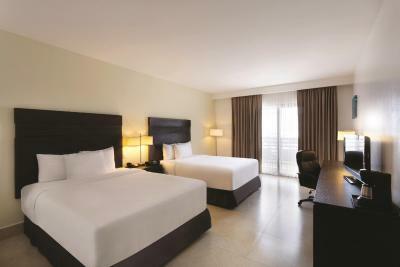 When would you like to stay at La Quinta by Wyndham Cancun? 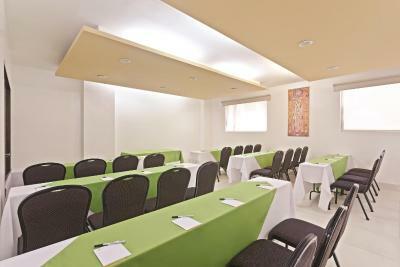 This air-conditioned room comes with flat-screen cable TV, free Wi-Fi and an iPod docking station. There is a microwave, fridge, coffee-maker and a private bathroom with a hairdryer. 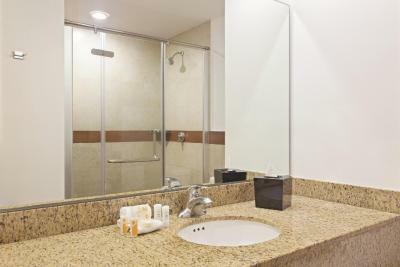 This double room features a iPod dock, sofa and tile/marble floor. 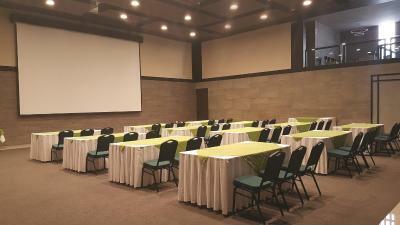 La Quinta Inn and Suites Canun is now LQ Hotel by La Quinta. 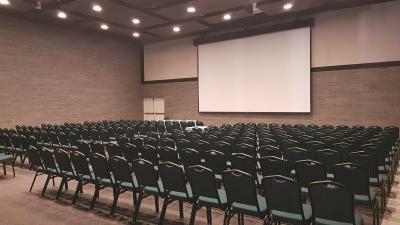 only minutes from the world famous Cancun white sand beaches and convenient to Banorte Regional Offices, Fira, Telcel, TV Azteca, Imss, Universidad Anahuac and ITESM. Rooms feature refrigerator and microwave. 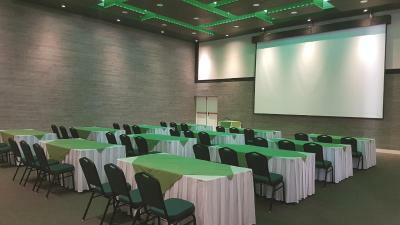 Enjoy free Ultra Fast wireless internet, daily free breakfast, free parking, business center, meeting rooms and fitness center. All rooms are nonsmoking. 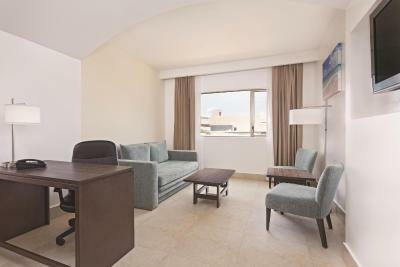 House Rules La Quinta by Wyndham Cancun takes special requests – add in the next step! 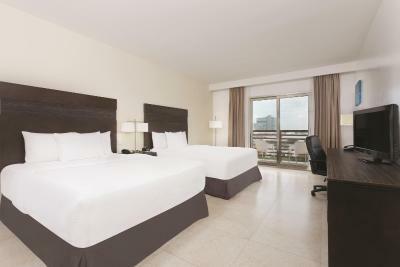 La Quinta by Wyndham Cancun accepts these cards and reserves the right to temporarily hold an amount prior to arrival. I’m a seasoned traveler and can resourcefully adjust to most everything. The bed was firm and comfortable. However, All The pillows were hard and lumpy. I tried but, I just couldn’t get completely comfortable for a good nights sleep. Another problem was, the hot water. Never got hot enough for me. Location was great, just perfect for staying a couple of nights after a long flight. Easy to get around, restaurants were within walking distance. staff were super friendly and gave us a room on the 6th floor which was great thank you! Away from the street noise. The beds are Amazingly comfortable!!! My bed sheets were old. It was a very bed smell in the room and all hotel from the AC and mold. This smell was everywhere in hotel. Also sheets wasn t replaced in 7 nights !!! Its for me one best hotel, all is good. The rooms are very clean. Some contruction is happening next to LQ hotel. Laundry service was out of service. Reception did not intend to repair the service and indicated us outside laundries if we wanted to wash our clothes. Thus this service is fake. We used the self service computer to print tickets from mail box. The night after, our Gmail account was hacked by a phone at cancùn. The hacker bought different things with Google account. We talk with the reception to alert them that potential hacking occurs on the computer. No answer. We received phone calls in the middle of the night from people who did not know while we were sleeping. Reception transfered the calls without checking the names of the owners room. It happened 2 different times. The shower was not sealed and lot of water came out the shower in the bathroom when taking normal shower. We were in in Cancun for one night before joining a tour. The hotel was clean with a nice breakfast. In the lane behind the hotel there is a nice Japanese restaurant. Check in was a joke.. three people complaining in front of me. When I eventually checked in I went up to my room and there was another guest in there who had been given the same room number! Eventually I got a room of my own.